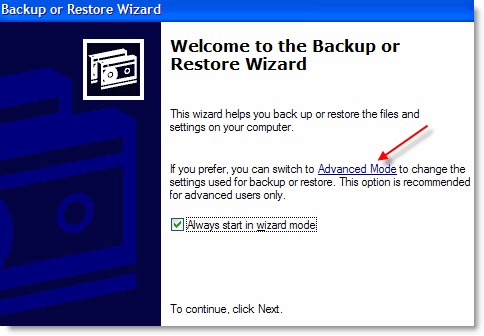 How to Backup the Registry in Windows 7, Windows Vista and Windows XP? 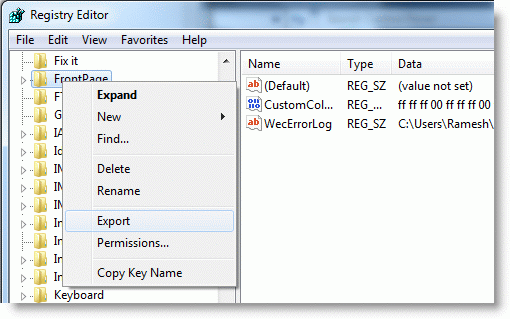 Registry Editor is an advanced tool for viewing and changing settings in your system registry, which contains information about how your computer runs. Almost the entire settings are stored in the registry. For example, when you resize an application window, the window position (x,y points) is stored in the registry so that the settings are retained permanently. This is just an example, there are much more data stored in the registry, right from your user account names and passwords (if configured to be stored). Making incorrect changes in the registry can break your system. It's highly advisable to backup the registry before editing any portion of it. One way to backup the registry is to create a System Restore snapshot. System Restore returns your computer to a previous snapshot without losing recent personal information, such as documents, history lists, favorites, or e-mail. It monitors the computer and many applications for changes and creates restore points. You restore these snapshots when your configuration isn't working. This method is unreliable in case you want to rollback the registry changes made a longtime ago, in which case the System Restore might have purged that particular restore point - due to space constraints or due to a recent system restore point or even a Restore point corruption. Please remember, System Restore points get deleted for many reasons, making it unreliable, especially in the long run. For more help, see Creating a System Restore point and Using System Restore to Undo Changes if Problems Occur for Windows XP PCs. 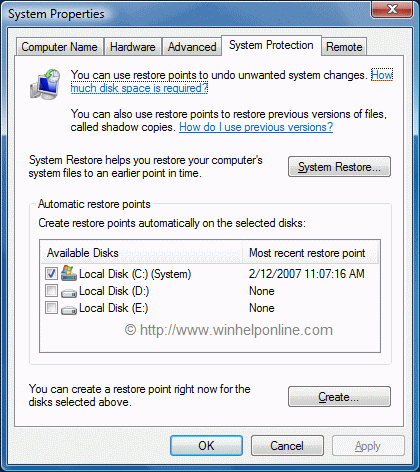 If you're using Windows Vista or Windows 7, see How to create a System Restore point in Windows Vista and Windows 7. Now that you've created a Registry backup for that particular key. Save the REG file in a safer location in case you want to undo the registry changes made. You can restore the settings by just double-clicking the REG file. It automatically merges the contents to the Registry. To view the REG contents type notepad D:\iolo.reg in Start, Run dialog. Console Registry Tool is extremely handy if you want to automate the backup task using scripts. To backup the entire registry (in hive format) you can use the excellent ERUNT (The Emergency Recovery Utility for NT) Utility, which can be used in Windows NT/2000/2003/XP/Vista and also in Windows 7. For more details with screenshots, check out the post Take a complete registry backup using ERUNT. 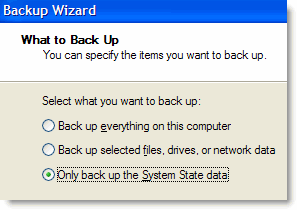 Additional Info For Windows XP Users: For backing up the whole registry, you may also use the NTBackup utility and choose to back up the System State. The System State includes the registry, the COM+ Class Registration Database, and your boot files. For more details with screenshots, see our article How to Update the Repair folder in Windows XP using NTBackup. NOTE: NTBACKUP is not installed by default in Windows XP Home Edition. To install it, use instructions in KB302894.